I can’t believe it’s been almost 2 months since I last posted! I feel like a let down of a blogger, but when I think about why it’s been that long, I realize it’s because I’ve been living life, and it’s been awesome! There has been so much going on this summer and I feel like time is rushing by because of it. This made me realize that I really do want to blog again, but I wanted to be more serious about it. Find my niche. When I started this blog, I didn’t know where I wanted it to go. I wasn’t all that familiar with blogging and tried to do it in my own way, but I don’t think I knew what that was yet. What all of this means is that I am starting a new blog. It’s been almost 9 months since I first started this baby of a blog and I think it’s time to move on. I started a new blog, Worries and Wisdom, in hope that it will be a more genuine version of this one. I’ll still write up restaurant reviews, move reviews, concert reviews (the Wisdom part) but I’d also like to get more personal and reveal more of my own thoughts and stories; connect more with readers and passers-by. I hope that you will join me on the other side as I try to find my place in the World Wide Web, and in life. And to those of you that are reading this now, thank you SO much. You have all supported me and rooted me on in times of question, left me comments and kind words and I truly appreciate that! Sorry for the almost one month delay on this one, but I TOTALLY forgot to write up a recap of our New York trip. I won’t bore you with the whole thing since we didn’t do that many touristy things to report on, but I did want to review the restaurant we had dinner at for my friend Kevyn’s 25th birthday. She said it was her favorite restaurant in all of New York City so I was really excited to try it. Even more so excited when she told us that the head chef, Chef Jehangir Mehta, was a contestant on The Next Iron Chef. 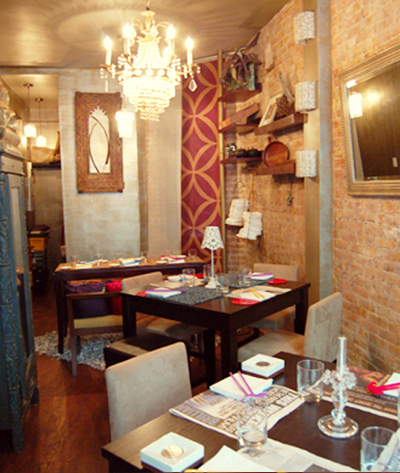 The restaurant is Graffiti Food and Wine Bar on East 10th Street. If you don’t know where you’re going you will miss it because the only sign of the restaurant is the bright orange door with the name “graffiti-ed” across the front. Sadly, this is the only photo I took at the restaurant! When you walk up to the door, you almost feel like you are in the wrong place. To your right is a set of stairs that leads down to some creepy, unknown place. To your left, more doors. Luckily, Kevyn had been here several times before so she knew we were in the right place. We opened the door and even though I had been warned about the size, I was shocked to see how tiny this place was. The place already had about 12 people inside but it felt like it was full. I honestly didn’t know where they were going to fit our party of 6, with a 7th on the way. You might think I’m exaggerating, but here is a shot of the restaurant taken from their website. This photo was probably taken standing just inside that orange door. The two tables in the front already had two parties seated at them so we were escorted to the third table you see in the picture. But it was turned sideways so we were sitting parallel to the wall. This meant squeezing in behind the table and sitting on tiny stools. 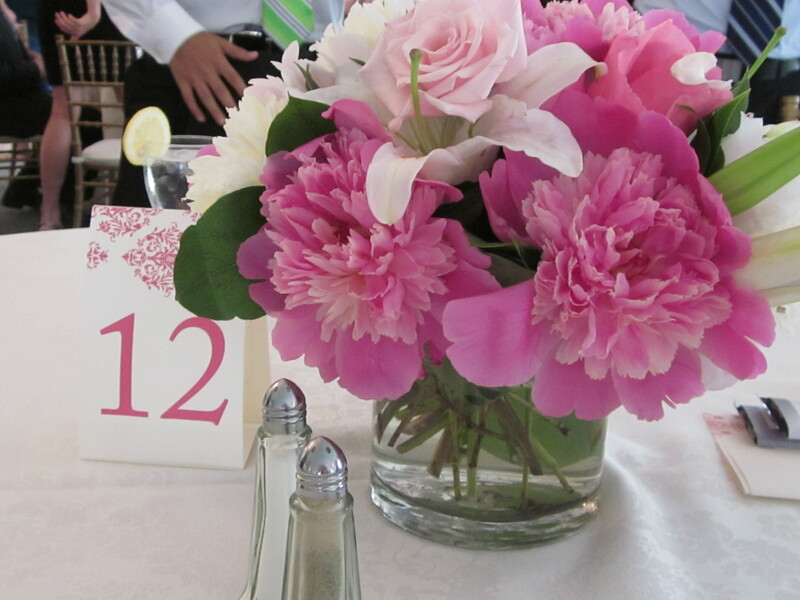 Did I mention there was another party of four sitting at our table? That’s the cool thing about this place, it feels like everyone there is friends even though you are sitting next to complete strangers. Behind our table, to the left, you can see the kitchen and the door to the bathroom. Smallest kitchen I’ve ever seen!! Once we were seated, our waiter came out to introduce us to the Chef. The Chef said hello and explained how it worked and then let us get to ordering. First we ordered Lychee Martinis. I don’t particularly like martinis, but these were divine. Full of flavor, and alcohol. For our first course we ordered Zucchini Hummus Pizza. This was one of my favorite dishes of the night. The next thing to come out was the braised pork buns with apricot chutney. Since I don’t eat meat, Chef Mehta made me veggie buns with apricot chutney. They were mouth watering and all the meat eaters said the pork buns were too. After the buns came the green chili shrimp with mirin daikon moong salsa. Don’t ask me what it means, because I don’t know, but I can tell you these were delicious as well. We licked the plate clean on that one! Next up, the graffiti burgers. Once again, Chef Mehta took care of me and made me my own special veggie burger. By this time I was so full I could hardly finish it, but it too was delicious. No meal anywhere is complete without dessert and this was no exception. We ordered a hazelnut chocolate caviar cupcake with chocolate chip ice cream and warm truffle almond strawberries with pepper ice cream. I didn’t try the hazelnut chocolate caviar cupcake but Noah was raving about it. The strawberries were delicious and I was surprised by how much I enjoyed pepper ice cream. At the end of the meal, we were stuffed and even though the plates were small, they packed a big punch of flavor. 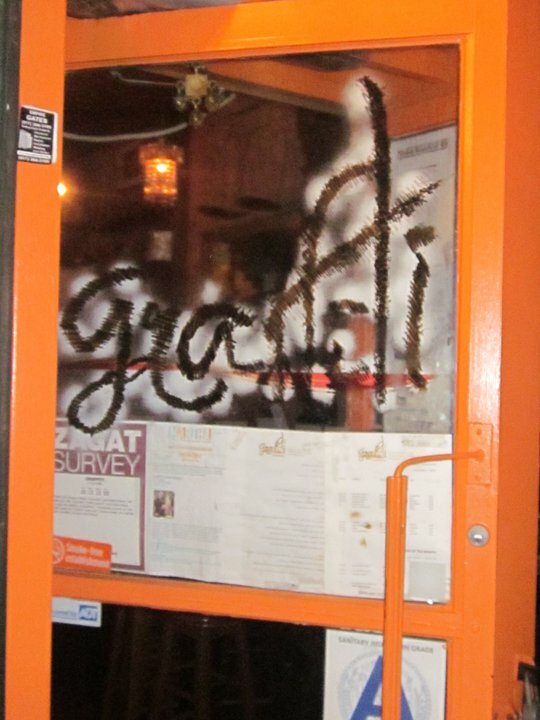 If you are in New York anytime soon and are looking for a one of a kind, delicious and exciting meal, I would highly suggest Graffiti. It’s not just the food that makes it, it’s the atmosphere and the attention to detail that stands out too. 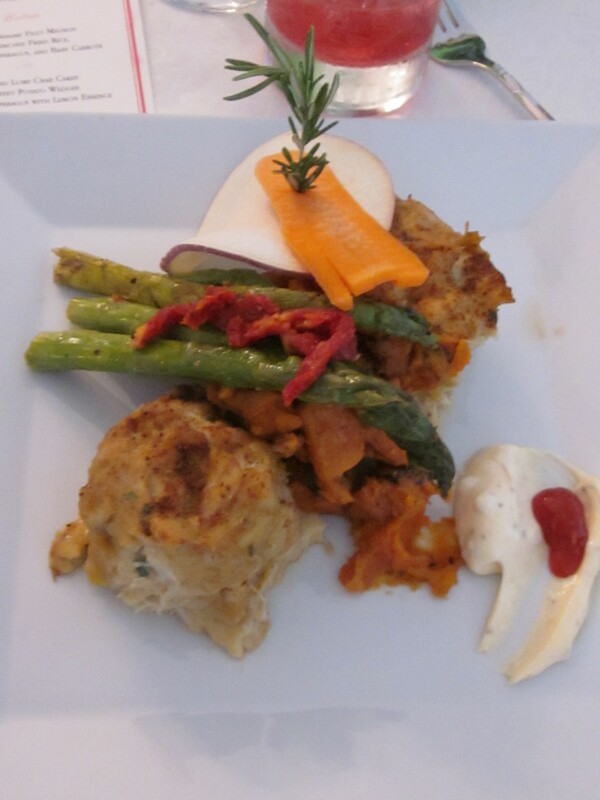 I was astonished that the Chef actually came to our table to explain every dish he was bringing out and made necessary accommodations for my needs that were still delicious. Just keep in mind, this is not the place for a romantic date night, but more so a place to go out with friends for a fun and memorable evening. I saw this fun blog post on another blog I read, KJ Pugs, and thought it would be fun to try out. I think it’s the perfect thing for a Thursday since it doesn’t involve much thought processing. I hope you all had a great Memorial Day weekend! Noah and I took yesterday off in order to make it a true mini vacation for ourselves. We had a great weekend and were very relaxed. 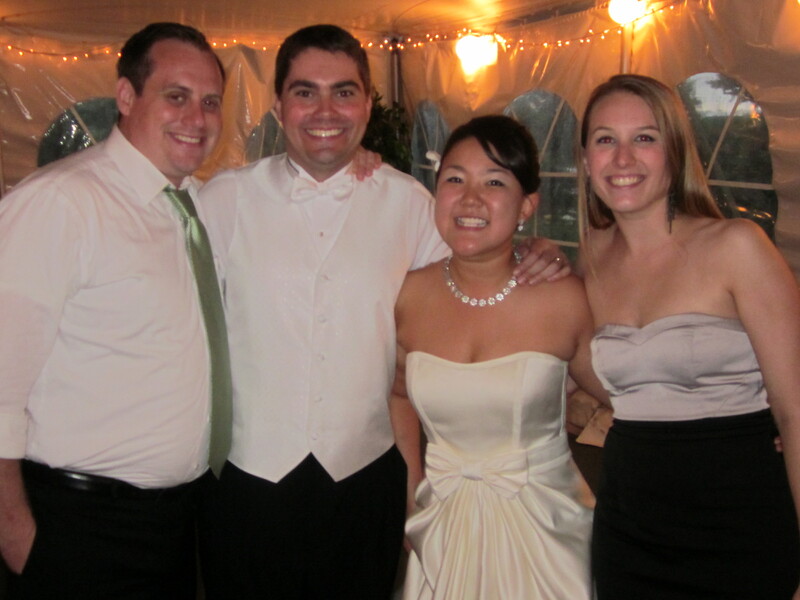 Friday night we went to our friends’ wedding in Frederick, Maryland. The weather was perfect for their outdoor ceremony and cocktail hour and everything looked absolutely beautiful. I love the attention that was paid to all the details. The food was incredible too! 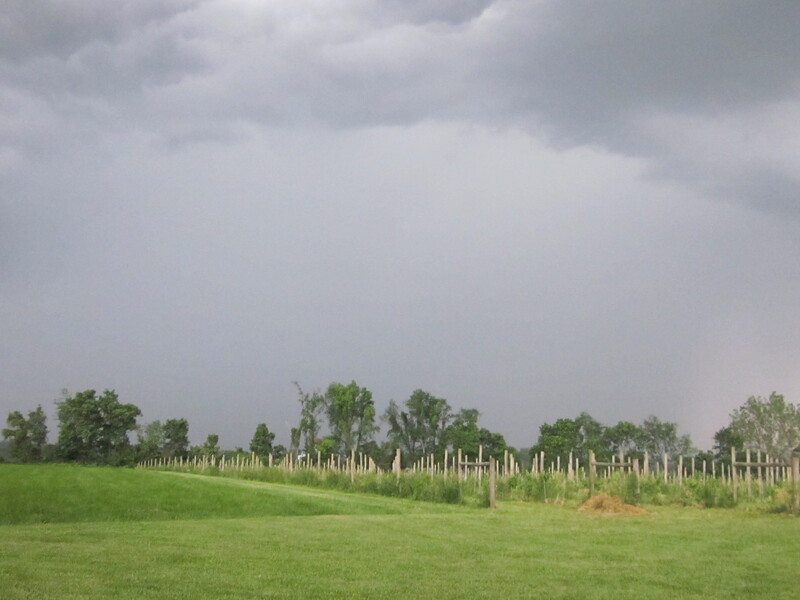 Then, about halfway through their reception we saw the sky turning black and overheard that there was a tornado watch for the area. I managed to snap a picture of the (somewhat pretty looking) sky right before the downpour and insane winds began. Oh, and the power went out right as I was sitting on the toilet. That was fun! Luckily, the venue had back up generators that they used until the storm passed. 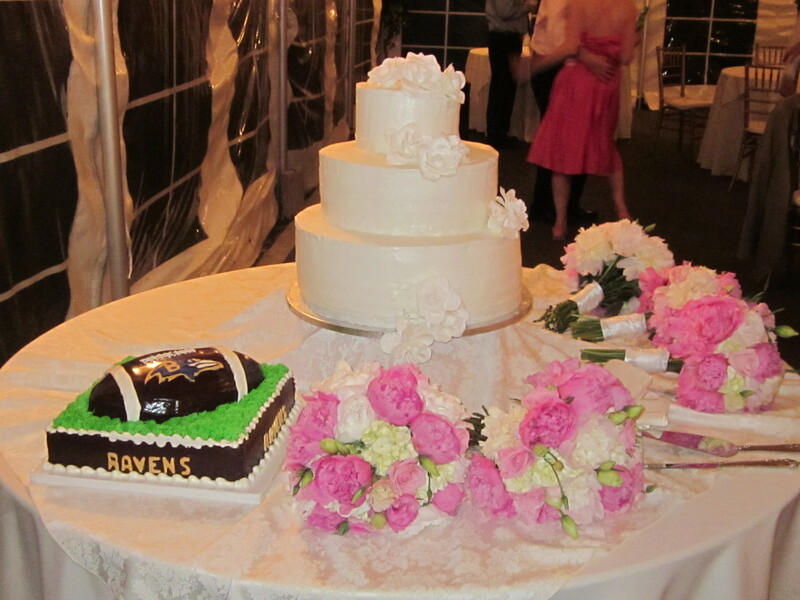 The bride and groom weren’t phased though which just goes to show that no matter what, your wedding day is awesome! All in all, we had a great time! Congratulations Shawn & Michelle! On Saturday, we drove to the airport to head to Georgia for our extended weekend. When we arrived in Atlanta we met up with Noah’s friend Mario and his wife to hang out and grab some lunch. I’ve been dying to try Richard Blais’ Flip Burger ever since Katie from SheLikesRuffles posted about it during her trip to BlogHer Food. Well, it did not disappoint! I had the “Fauxlafel” burger and fries with a Cap’n Crunch milkshake. It was freakin awesome. Unfortunately, my phone was dead at this point so I did not manage to get any pictures of our lunch, or more importantly, with our friends! 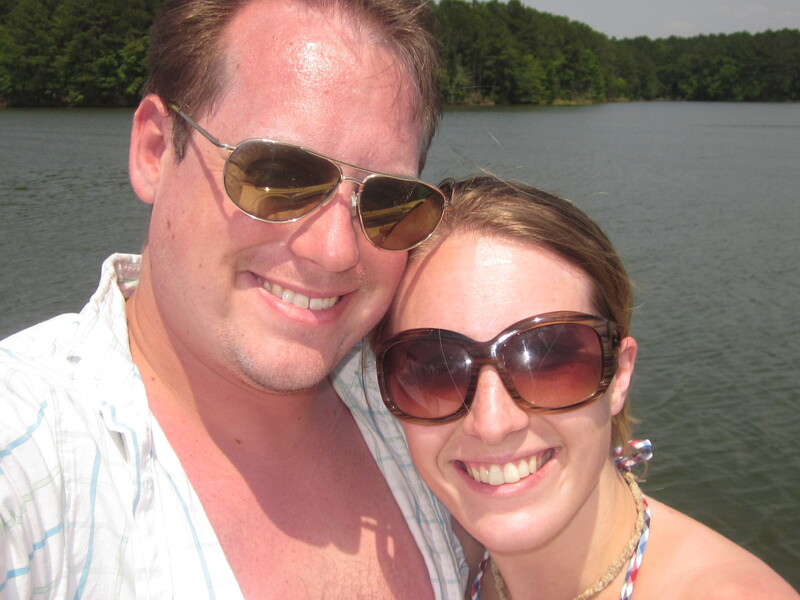 After dinner and some down time we drove out to Lake Oconee. We spent the next three days hanging out at the pool, going out on the boat, golfing (Noah), hanging out with family and friends and eating a lot! We also saw Hangover 2 (which was terrible) one night once everyone else had left. I didn’t take many pictures throughout the weekend (I was too busy sunbathing and/or babysitting my nephew with my sister in law and cousin) but here are a few I managed to get. We came home late last night, but luckily I am working from home today. I hope you all enjoyed at least one day off this past weekend! Can you believe it is June already?! Rabbit rabbit! I don’t consider myself to be an extremely crafty/artsy person, but I think sometimes I underestimate that. Maybe it’s just that I haven’t let my creative juices flow for a long (very long) time so they need a little tune up! Recently I’ve been back into crafting and creating and it has been making me really happy. Of course, not everything I’ve done is perfect or even complete, but it feels good to make something with my own two hands. Something that I have either thought of completely on my own or been inspired to make by something else…most likely something I’ve seen on Pinterest. To give you an update, here are just a few of the things I’ve made recently. 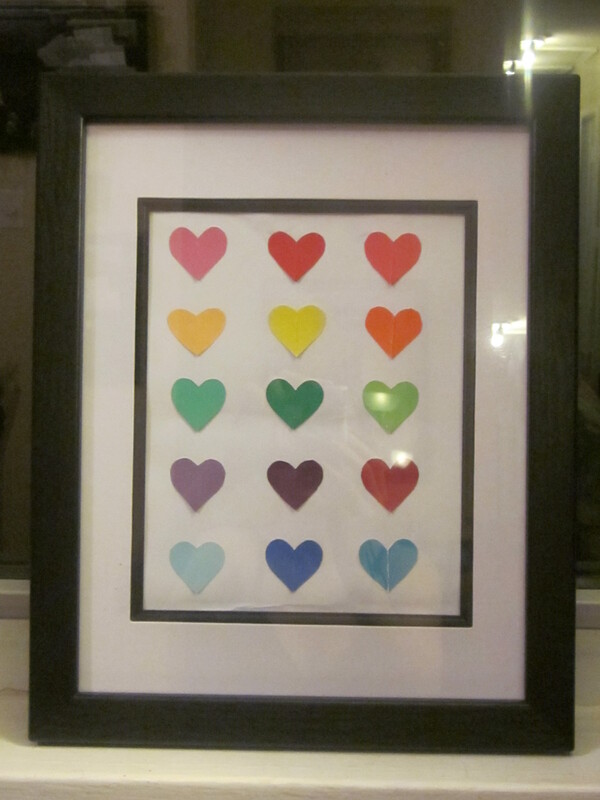 First is the paint chip heart print. This was SO easy. 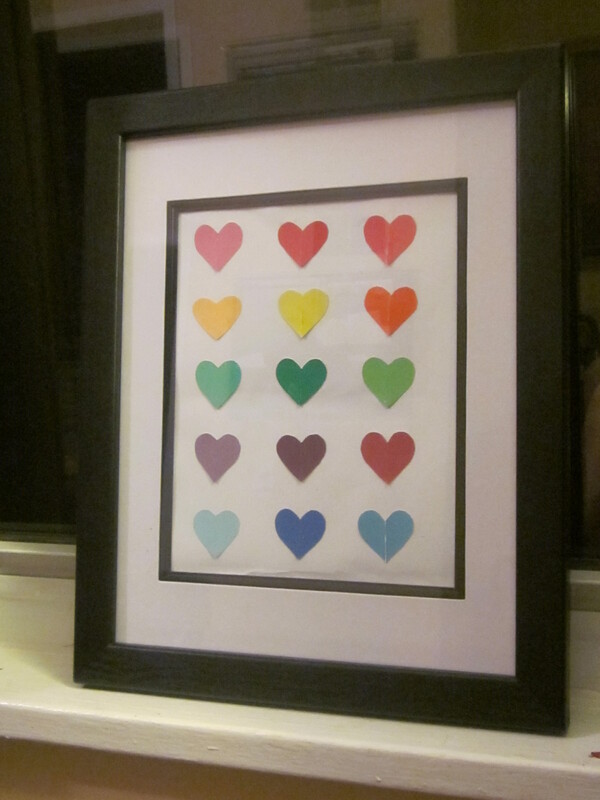 I collected colorful paint chips from Home Depot, cut them into hearts of the same size, taped them onto a sheet of white printer paper and put it in frame I already had. Eventually I want to either get a new frame or spray paint this one white. 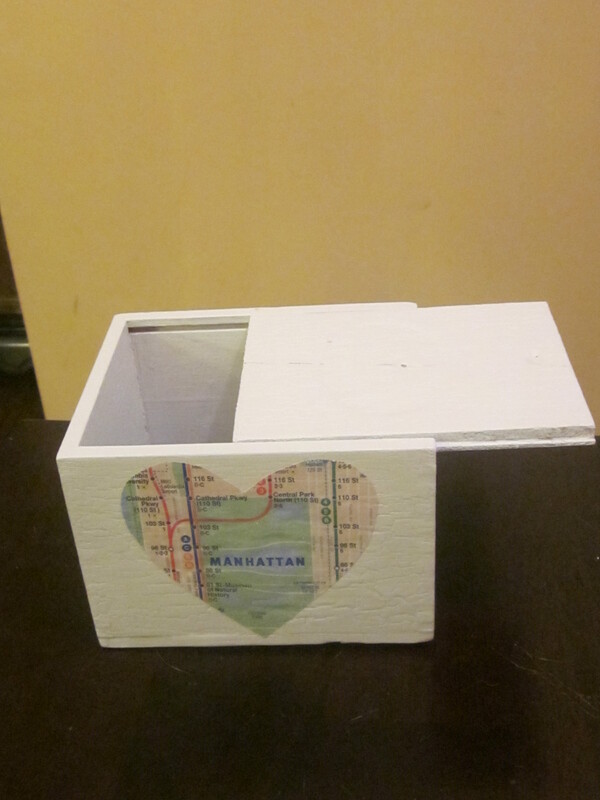 The second thing I did was refurbish a little wooden box I found at a thrift store for under a dollar. It was originally a crackled wood that I spray painted white. 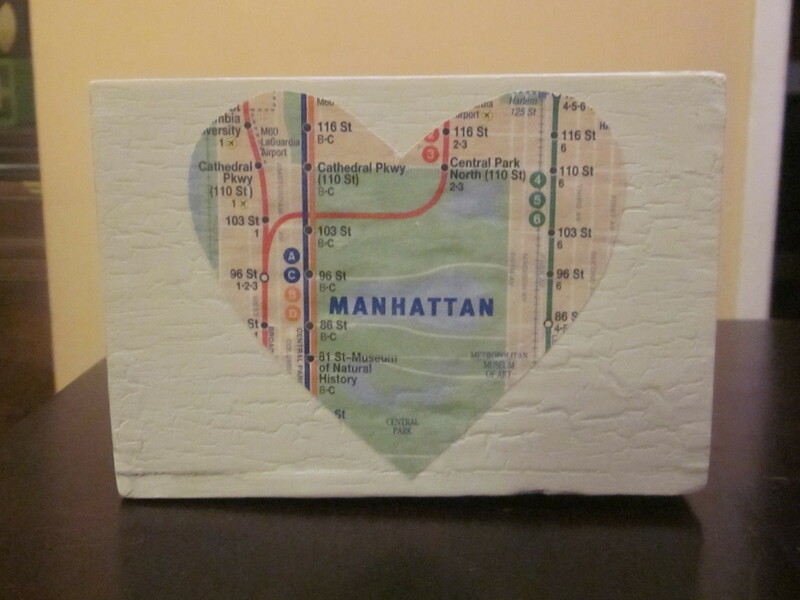 Once it was dry, I used a heart cut out of a subway map that I had and decoupaged it onto the front of the box. I love this little box so much! And I love Manhattan! 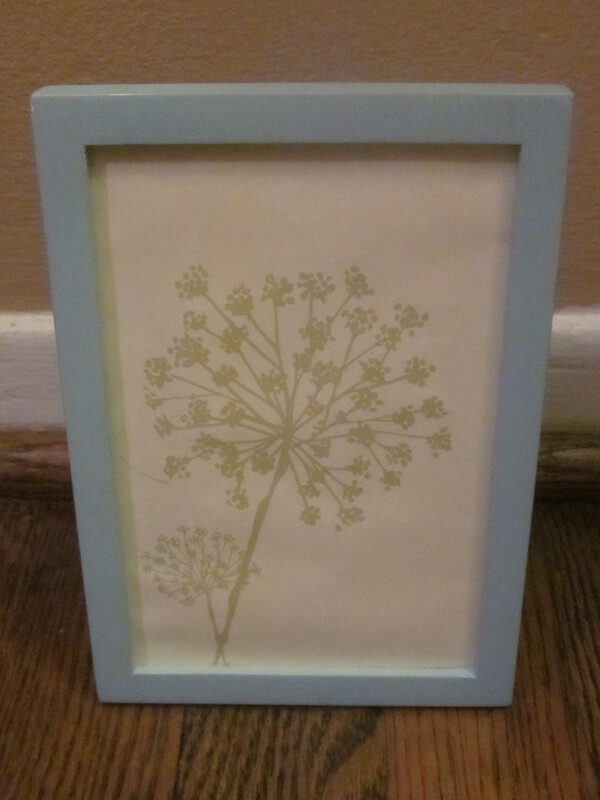 The next project, which took me about .2 seconds, was framing some dandelion paper I had left over from stationery I used during our wedding. I would like for the frame to be white eventually (I want all white frames at some point) but for now I kind of like the contrast of the blue and green and how colorful it is. I learned that framing stationery is one of the simplest ways to have a brand new piece of “art”. 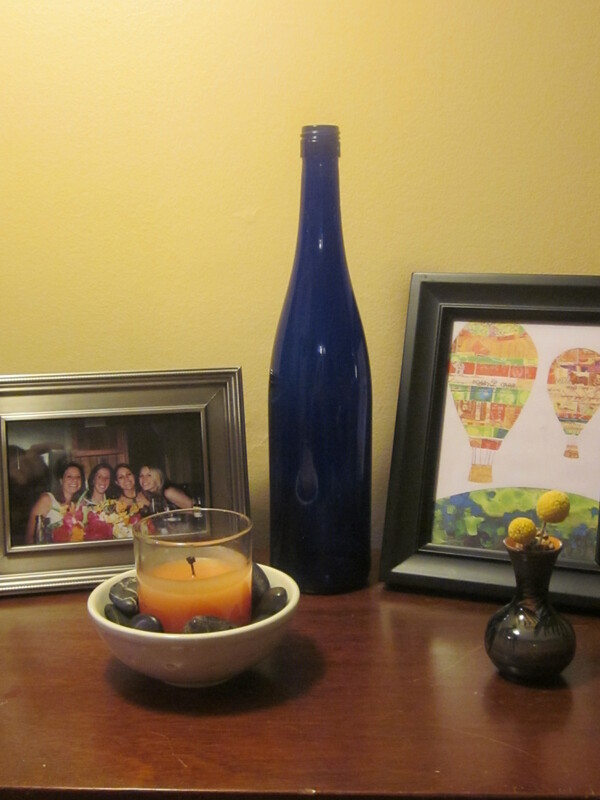 Last, but certainly not least is the wine bottle I turned into a decorative piece/occasional vase. I say occasional because it is rare that we have flowers in the house since our cat Eddie loves to eat them. 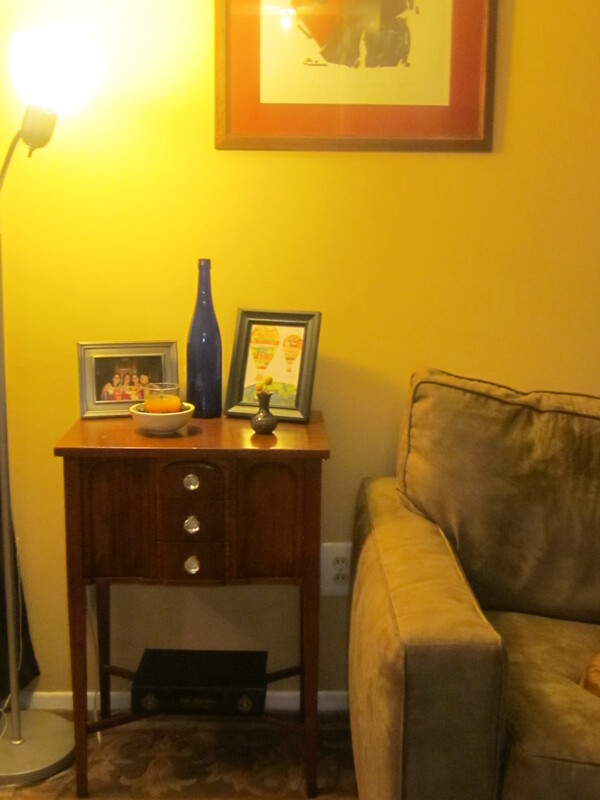 But even on its own I love the pop of color this adds to the room! All I did was take an empty bottle of wine, soak it in warm water and dish soap for a little while then peel off the label and clean it off. So simple for such a fun result! I hope you enjoyed all the crafts I’ve been working on! This post has been several months in the making. Next time I will show you my biggest (and most fun) craft project to date…simple, cheap and fun DIY magnets! It seems easy enough. You think you know what to do in certain situations and you think that you would have things under control. Until you’re in them. What I’m referring to is the small fire that we experience at my sister in law’s apartment on Friday night. We had gathered at her place for our monthly fondue night and were really excited to eat some delicious cheese. As we were hanging out and having a few beers, Nancy and Sandi were in the kitchen preparing the food. The oven was on and all of a sudden the smoke detector started to go off. We thought it was weird since nothing was smoking, it just looked like normal steam since there was a pot of water on the stove. Our friend Garrett removed the smoke detector from the wall because the sound was irritating and we figured since the apartment was small it would only continue with the steam from the boiling water. After a few minutes, we realized that it was not just water steam…there was smoke coming out of the bottom of the oven. Noah opened the drawer to the oven and flames were coming out at full force. He immediately grabbed the fire extinguisher and put out the fire. If you have ever used a fire extinguisher, you know about the white film/powder that fills the air when you use it. So all 6 of us decided to go out onto the balcony, with the two dogs, in order to escape the fumes. We opened the apartment windows and decided to let things air out. Well, that wasn’t really the brightest idea. We realized this as soon as we saw the black smoke filling Nancy’s apartment. We then went inside, all ducking down, and walked through the smoke filled apartment in order to get out. We stayed there for about 20 minutes just to make sure the fire was out and we didn’t need to call the fire department. Fondue night turned into a night of beers at home and cheap (gross) Mexican food at On the Border. But the most important thing was that no one was hurt and nothing was damaged. After the fire, Noah and I started talking about how it was a wake up call as to how to respond in an emergency situation. You think you know what to do in a situation like that until you are in it and aren’t using common sense. AKA – immediately get out of an apartment where there is a fire!! Since that night, we have decided to discuss an emergency plan. We are going to pack bags with extra clothes, blankets, water, food, flashlight and first aid kit in each of our cars. We are also going to discuss how we would get out of the house in case of a fire or other emergency and how we would handle wrangling up the pets. It’s a scary thing to think about, but it could be a matter of safety and injury, life or death. I’m not one to preach, but if you get anything out of this post, it’s to be prepared. It’s to know your plan of action in advance and be ready to put that into place if something were to happen. I hope all of you stay safe, always, but especially over this coming Memorial Day weekend! Make sure to replace those smoke detector batteries and be sure to keep a fire extinguisher in your kitchen! That’s right, I don’t eat meat…now move on! It has now been about 4 months since I stopped eating meat. I still eat fish, but I refer to myself as vegetarian, mainly because I despise the word “pescatarian”. I don’t know why, I just do. The past 4 months have been great for me. I have felt healthier, had more energy and just feel better about myself in general. The only problem that I’ve experienced in this time has been people’s astonishment that I don’t eat meat. And the dreaded question….WHY. Here’s a typical scenario for you. Out to dinner with friends…. Friend: Ohh you want to split the chicken lime tacos? Me: No, thank you. I don’t eat meat. Me: It’s been a few months now. Me: Because I just don’t want to. It literally happens like that every single time. And it REALLY bothers me. I am so sick of the question. Why do you care so much if I don’t eat meat? Is it a requirement that as a human being I have to eat meat? I don’t feel like I need to provide a reason for the choices that I make, especially when they are not affecting anyone but me! But yet for some reason, everyone feels the need to find out more. As if I need a reason. I don’t ask you why you do eat meat, so don’t ask me why I don’t! I could say it’s because I love animals or because the texture grosses me out or the whole concept gives me a slight bout of the heebie-jeebies, but instead I always say because I just don’t want to. Because that is the truth! I have no desire to cut into a whole chicken or chomp down on a burger. I just don’t. And I wish people would just leave it at that….and move on.